Friday: I didn't go on the bus tours because I had to move into my apartment but I did make it to the TV Academy Friday night. The had a montage of clips at the beginning and Lucy on a Bob Hope Special singing " Comedy Ain't No Joke" . After that they did a video tribute to Gary Morton with clips Lucy and non-Lucy related. The big tribute this year was to Bob and Madelyn. They had a nice video about them and had a few people talk about their work including someone know one had mentioned, Steve Allen. Now if being in the same room as Steve Allen wasn't enough Tom said that he found someone to present the award to Bob and Madelyn and then brought out Lucie Arnaz. Wow. During the intermission I just happened to be in the right place and with the camera rolling at the right time and happened to catch Lucie running into Carole Cook. Wow and two more days to go. Saturday: After taking a trip around the vendor area I headed over to the panel discussions. This year they advertised one panel but they ended up with too many people and they had two for the price of one. The first panel was Bob, Madelyn, Bob Shiller, Dann Cahn, Maury Thompson and Jay Sandritch. As someone mentioned the big thing was Dann talking about the color episode but he also had a little card board cut out he brought that was used for the club marquee that is used in many of the episodes and he described how that was made. 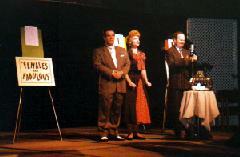 The second panel was the Borden Twins, Keith (Little Ricky), Bart Braverman and Doris Singleton. Later that day was the auction with a lot of stuff this year. 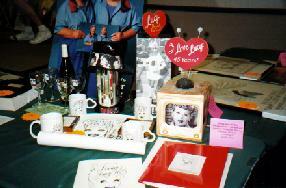 There were over 100 lots and that didn' t even include Ric Wyaman's stuff, which was about another 30 items including original I Love Lucy pajamas from the 1950's. The coolest thing at the auctions that failed to sell (the start price was $5000) was the garter from Lucy's second marriage to Gary Morton. A friend of Gary' s that caught it was willing to sell it with original photos included. There were also personal memories of Lucy by friends and co-workers that were auctioned off for one of Lucy's favorite charities The Orthopedic Ward of the Children's Hospital in LA. That part of the auction raised over $15,000 for them. That night was the Banquet show and the theme was the USS. Constitution. A few of my fellow Lucy List members were in the show. And it was pretty cool seeing Tab Hunter too. I had never seen Keith play the drums before and to see 1/3 of Dino, Desi and Billy was neat too. And as always everyone involved including Lucy and Ricky were wonderful. Sunday: I didn' t go to the author's breakfast because I had all the autographs so I wondered around the vendor area again and bought some stuff from Cathy and the Museum in Jamestown. The Trivia contest was next up and to start it off they did the Mr. and Mrs. Quiz show with Lucy, Ricky and Freddie Filmore. I did lousy this year eliminating myself on the second question but they put in really hard True and False off the bat. They played two games and our fellow list member Eva won the second game. Congrats and its nice to keep it in the family The final thing of the convention was the Lucy: Up Close and Personal Panel with Carole Cook, Frank Gorey, Irma Kusely, Bernie Weitzmen, Wanda Clark, Eve Whitney (Maxwell) and Lucie Arnaz. It was really good and nice to hear some of Lucie's stories and Carole was just funny. Of the funny things that happened was during the middle of the discussion Lucie stopped it and told us all to turn around and look who was standing in the back of the room. Suzanne dressed in all her Lucyness was standing next to Adrian who was dressed as Ricky. And for those who have seen these two they are almost dead ringers for Lucy and Desi. Lucie said that from where she was sitting they were a little blurry but just enough to freak her out a little. All in all it was a great convention with a great roster of people and for being my second convention it was as great as my first and I want to say thanks to anyone involved for putting such a great weekend together.